Updated rendering of new proposed Domino redevelopment. Image courtesy of SHoP Architects. Landmarks endorsed project with modifications that better displayed factory’s industrial character, and historic sign and chimney. On January 14, 2014, the Landmarks Preservation Commission voted to issue Two Trees Management a Certificate of Appropriateness to convert the Domino Sugar Refinery for commercial and office use. The plan includes glass-and-steel additions on two roofs, demolition of non-historic accretions, and the creation of windows and balconies. The adaptive reuse of the former factory is part of a larger development on the Williamsburg waterfront approved by the City Council in 2010. Landmarks approved a proposal for the site in 2008, which would have converted the building to residential use. The approved project was never realized and the developer sold the structure to Two Trees later that year. Two Trees presented a revised plan for the site in December 2013 that retained much of the design elements and massing of the prior plan, but adds a new glass-and-steel addition to the lower roof facing Kent Street. The new plan also creates a waterfront component where industrial artifacts from the refinery would be installed, and includes a publicly accessible lobby with an exhibition of the area’s industrial history. The plan was greeted with enthusiasm from local elected officials, as well as local businesses and community organizations, who welcomed the introduction of high-profile office space into the neighborhood. Some preservationists objected to certain elements of the plan, arguing that the rooftop additions as proposed would obstruct important aspects of the factory’s roofline and chimney. Commissioners found the approach generally appropriate, but asked for additional refinements to the design of the rooftop. Beyer Blinder Belle architect Jack Beyer testified that that the Two Trees modifications would allow panoramic views of the landmark and create a public park. The latest revisions to the proposal since the December presentation include changes to the design of the rooftop addition to create a more horizontal orientation and a contrast to the vertical arrangement of the original factory. Beyer stated the additions are inspired by the industrial rooftop mechanical equipment and water tanks of Brooklyn. The applicants lowered the addition on Kent Avenue to allow the original brick building to be visible from the street. 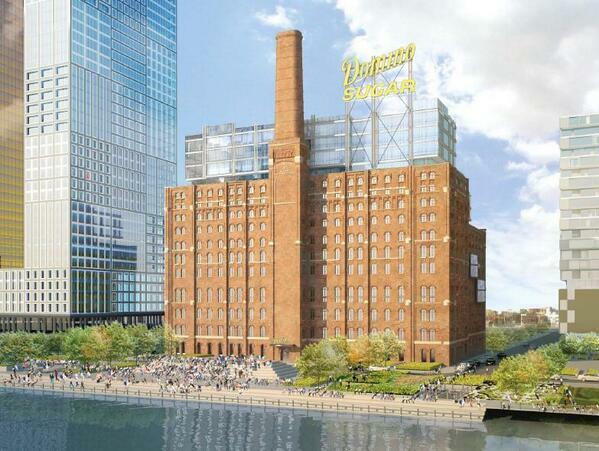 The applicants would modify the placement of the historic “Domino Sugar” sign to give it a “more dominant, heroic, and asymmetric” relationship to the new addition. The Commissioners unanimously endorsed the revised proposal, and Chair Robert B. Tierney calling it a “felicitous conclusion” to a saga that began with the refinery’s 2007 designation. Commissioner Libby Ryan stated that the modification to the Brooklyn-facing addition was “done masterfully,” and made project appropriate. Commissioner Dian Chapin found the articulation of the additions made the project “less monolithic” and “more contextual.” Commissioner Michael Goldblum found the “really bold” proposal successful because of the depth of texture in the additions. Commissioner Goldblum asked the applicants to work with Landmarks staff to ensure that the “depth of articulation and detail” of the renderings will be retained in the construction process. LPC: Domino Sugar Refinery, 292-314 Kent Ave., Brooklyn (14-6970) (Jan. 14, 2014) (Architect: Beyer Blinder Belle).